The Body Shop's little £3.50 hand creams are my favourite as they absorb really quickly so I'm happy to use them as and when I need them through the day. I recently signed up for a new Love your body card and as I did it in my birthday month it meant I was entitled to £5 birthday gift. I've never tried one of The Body Shop's slightly more expensive hand creams but as they're £5 exactly I thought it was a good opportunity to pick one up. There's four available, hemp, almond, wild rose and absinthe, and I decided to try the almond one. In my haul post a few weeks back I mentioned that because these ones are bigger than the £3.50 tubes I assumed there was more in them. As you can probably see in the picture there's actually exactly the same amount in both tubes. As there is the same amount in both I'm not sure why one is £1.50 more expensive than the other; I'm assuming it might be because the more expensive one is slightly more 'luxury'. Although I've just checked online and the £3.50 ones are now £4. As this is called an almond hand cream I'm pleased to see that almond oil is the fourth ingredient as The Body Shop can be be guilty of naming products after an ingredient that is only there in very small quantities. The £3.50 £4 hand creams are quite highly scented but this one is quite subtle, although that might be because almond is quite a subtle scent in itself. I haven't smelt any of the other scents so I don't know if they're stronger. It's a light cream, so it might not be enough in the winter if you suffer from very dry hands, and as soon as you start to rub it in it melts down to an almost water like feeling. Just like the cheaper The Body Shop hand creams it absorbs very quickly, although maybe not quite as quick, and doesn't leave any greasy residue behind on your hands. Although I do like this hand cream I personally prefer the cheaper ones and as they are cheaper it's a bit of a no brainer really that those are the ones I'll be buying in the future. You can buy The Body Shop's hand creams in store and online. free delivery when you spend £10. Use code 14671. 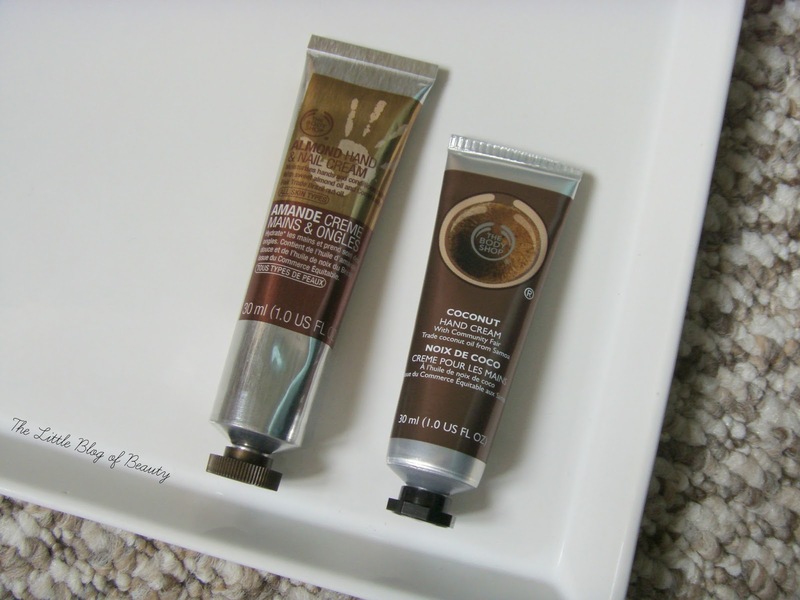 Are you a fan of The Body Shop's hand creams? I find that the slightly more expensive hand creams work waaay better for me - but I do have extremely dry hands! My favourite is the Hemp, it works like a miracle. I'm sold on anything coconut! !